Who says that winter could not be fun? 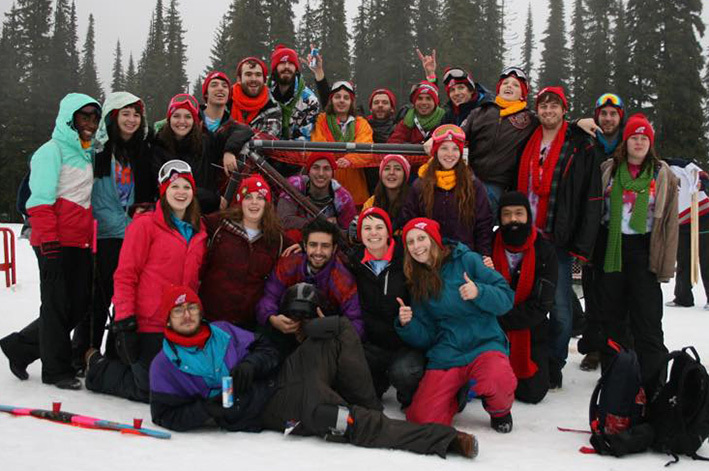 Last month, a group of uOttawa students entered the Great Northern Concrete Toboggan Race, also known as GNCTR. Dedication, teamwork, and most of all fun are the components for an epic engineering competition hosted by the University of British Columbia. The GNCTR is a yearly event that brings together over 20 Universities and Colleges from across Canada and the United States. Students must design and build a toboggan to compete in the race. “I have been actively involved with extracurricular activities during my university career but the one that I recommend most, and can guarantee will be a life-changing experience, is being a member of a competing GNCTR team”, explains Brian Perry, an engineering student who has been competing for three years now. The GNCTR was held in Kelowna, B.C. from January 21 to 25, 2015. Twenty-four engineering students took part in the race and marked the sixth time that the University of Ottawa has participated in this fun and learning competition. “The students’ hard work in the past several months culminated on the final day of the competition, where the University of Ottawa team placed third in the “King of the Hill” head-to-head elimination speed contest, and completed the slalom track with the fastest time, securing the “Best Steering Performance” award. This award in particular was years in the making, as a lot of work had been done by the students to perfect the steering system—special credit goes to the mechanical engineers of the team”, mentions Professor Ghasan Doudak. The first race took place in 1972. After a difficult start in the first three years, the event has been a huge success with an increasing number of students each year. Since 1975, engineering students has organized the event themselves, and had been having fun competing against each other. “For those who haven't gone, it seems like any other engineering related event. However, for participants it is the most anticipated time of the year. The competition itself teaches you many important skills; the majority of learning experiences come from the toboggan design and build, the intense sponsorship campaigning, as well as the teamwork and creativity involved with planning the team's theme”, says Perry. “Ghasan, thank you very much for all your active involvement with our uOttawa GNCTR team. Please extend my thanks to all the members of the team. Their success bodes well for next year! ”, says Engineering Dean Claude Laguë. The University of Ottawa will be next year’s host of the GNCTR, an event that will gather around 450 engineering students representing over twenty teams that will compete once again. We can’t wait to see you in 2016!